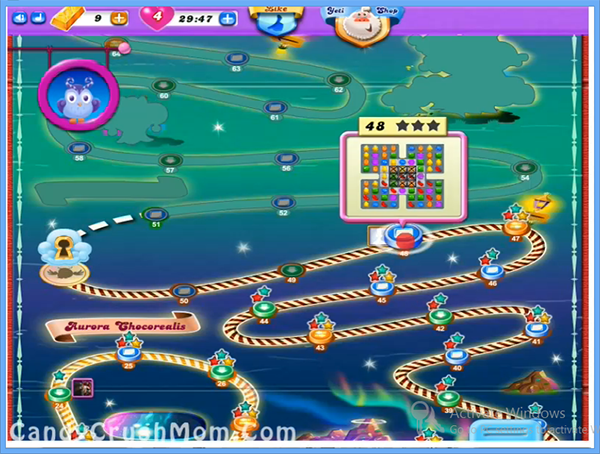 This level is little bit difficult and has hard candy board with jellies under grill boxes. To complete this level you should try to break grill boxes first so you can have chance to play with more candies and can make more special candies. You can break jellies with increasing moon power and as moon will struck it will break candies of same color and will give more chance to make more colorbomb. You shouldn’t waste moves and try to make special candies and break with each other. You could forget to balance The Odus owl and try to combine colorbomb with striped candy to end game fast. WE completed this level with 165600 within 19 moves and got single colorbomb that help to reach requirement and get three star score.